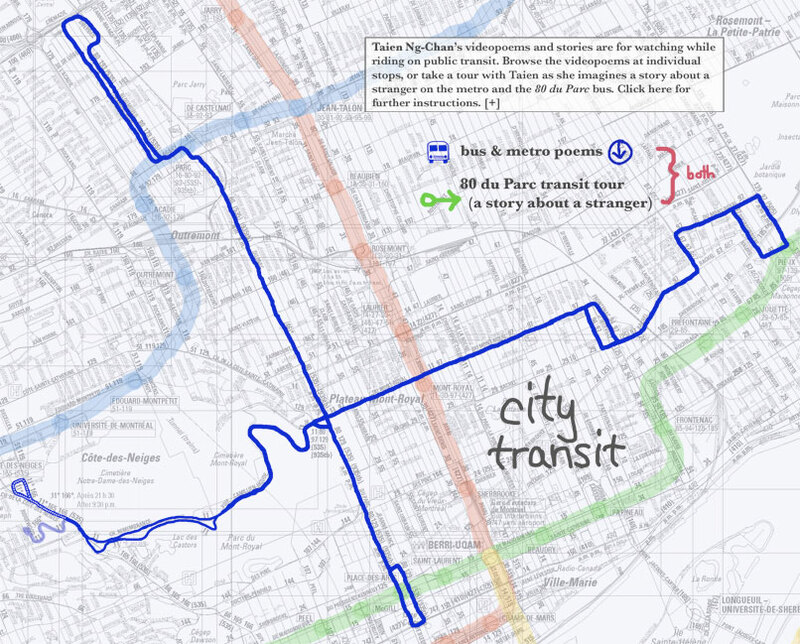 Detours is designed and directed by Taien Ng-Chan, who also contributes two maps: City Transit, video-poems and stories about riding the bus and metro, and Streets of the Saints, a playful melding of geography, hagiography and poetry (with the help of Byzantine iconographer Adrian Gorea). Excerpts from Lance Blomgren's Walkups are mapped out to Gord Allen's sound explorations, finding stories and absurdities in the lives and dwellings of Montrealers. For City Ditties, Samuel Thulin creates mobile media music, using only sounds recorded on-site, and creating them on-site as well, on an iPhone. Emilie O'Brien's Field Notes invokes Maguire Meadows, aka Le champ des possibles, with embroidery, textworks, images, and an interview with the creator of the Roerich Garden project. Donna Akrey maps the Desirelines that she encounters in her travels through the city – those paths made by people pursuing the shortest distance between two points. 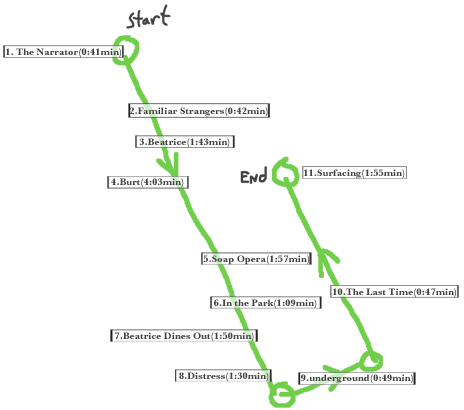 The works presented here are optimally viewed or listened to in the places that inspired them, though they also beckon to the armchair tourist. Detours is meant to be a mobile media project, accessible through tablet computers and smart phones; but for the moment, it is optimized for the iPad or the web (headphones recommended). Detours: Poetics of the City was produced by Taien Ng-Chan and Agence TOPO. Taien Ng-Chan would like to thank Agence TOPO for their support of this project, and to all her collaborators for their wonderful work. And thank you to Joe Ollmann and Samuel Ollmann-Chan, as always. Agence TOPO would like to thank the Conseil des arts et des lettres du Québec, the Canada Council for the Arts, the Conseil des arts de Montréal, the City of Montreal, and the Society for Arts and Technology for their support. Donna Akrey is an artist and teacher living in Montreal. Her work reflects her interest in the urban environment, language and communication, body and mind and the power of the habitual on our dreams and realities. Gordon Neil Allen is a Montreal-based audio engineer and composer for film, theatre, and dance whose work has been part of performances across Canada and France. In 1998, while living in Toronto, he co-founded Technot, an organization committed to the presentation of live experimental electronic music. He had the pleasure of accompanying multimedia artist Renée Gagnon to the 2009 Festival d'Avignon for her presentation of "Project McQueen". Gordon trained in audio post-production and music production at The Banff Centre in Alberta. Lance Blomgren is a writer, curator and artist based in Vancouver and Dawson City. Adrian Gorea is a Ph.D. student in the Interdisciplinary Doctoral Program in Humanities at Concordia University, combining studies in Visual Arts, Art History, and Theology. Adrian considers popular culture in relation to the artistic methods of Eastern Orthodox icon painting, in order to propose a mode of critical inquiry that challenges the corporate aesthetics of commodities. His practice as a Byzantine iconographer in Romania, where he painted religious murals and icons for several churches, led him to argue that an icon could be a valid subject matter for contemporary art, despite the fact that artists, for the most part, have shied away from religious art. Adrian's work has been exhibited in Europe, Canada, and United States. Emilie O'Brien is a Montreal-based artist. Through slow and often improvisational processes she creates text works, paintings, sculptures and video work. These projects respond to and often meditate upon fragmentation and the multi-faceted whole, with an emphasis on connection, or a disconnection, of these parts. Since graduating from Emily Carr Institute of Art & Design in Vancouver BC, Emilie has participated in exhibitions and projects on a local, national and international scale. With her partner Billy, Emilie runs Monastiraki Gallery, a curated boutique of curiosities and art in Montreal. 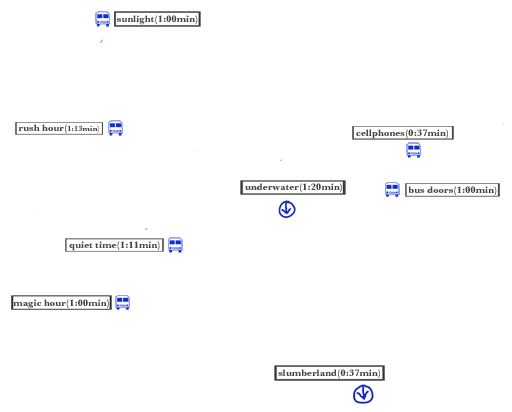 Samuel Thulin is a musician, researcher, and media artist living in Montreal. His work is concerned with concepts of mobility and place, as well as the history of media and technology. He is a member of the Mobile Media Lab and PhD candidate in the Communication Studies department at Concordia University. Élizabeth Robert is a literary translator, member of LTAC, who specializes in poetry and Spoken Word. She holds a Bachelor of translation studies from Concordia University and has signed several translations of poetry with various Canadian and European publishers. As a full member of The League of Canadian Poets, Éliz Robert performs her own creations in French, English and Spanish. She has presented and performed her work in Canada, Europe, USA and South America. When on the bus, press Play. When the bus reaches this intersection, press play. Ave. du Parc / Villeneuve When the bus reaches this intersection, press play. Ave. du Parc at Rachel (at the angel). When the bus reaches the Angel (the George-Étienne Cartier Monument), press play. Ave. du Parc at Ave. des Pins W. When the bus reaches this intersection, press play. Ave. du Parc at Rue Prince Arthur W.
Ave. du Parc at Rue Sherbrooke W.
When the bus reaches the Place-des-arts Metro, exit the 80/535 bus. Descend into the Place-des-arts Metro. Take the Green Line, direction Honore-Beaugrand. When you are in the metro car, press play. When you reach Metro Berri-UQAM, transfer to the Orange Line, direction Montmorency. When your metro car reaches Metro Mont Royal, exit and ascend. When you are standing in Square Gerald-Godin, press play. You are invited to watch a story about familiar strangers unfold as you are surrounded by strangers in the non-place of the bus and metro. What happens in other people's lives, and how are we responsible for one another? To take the 80 du Parc transit tour, go to the starting place indicated at Avenue du Parc and Avenue Van Horne. When you are ready, click "start." The first clip will begin to play. There are eleven clips in total for this story, each meant to be watched in a different location. There will be further instructions following each clip. Assistant Camera: Ameesha Joshi. Gaffer: Vincent Lafrance. Grip: Marco Luna. Sound Recorder: Philippe McKie. Production Assistant: Anurag Dhir. Sound Mix: Tim Horlor. Make-up/Hair: Judy Wong. Thanks to the Société de transport de Montreal, Marielle Nitoslawska, Marcus von Holtzendorff, Liane Keightley, Arts Café, the Mel Hoppenheim School of Cinema at Concordia University.